Vishal Bhardwaj! 2 words that are enough to grab the attention of anybody who possesses a deep, undying love for Bollywood, for he’s a film-maker whose brand of cinema may be rooted in a filmi duniya, but when he narrates a tale, it breaks almost every rule that Bollywood throws at it, right from the narrative, to the characters, to the music and almost everything else that he throws into his filmmaking process. After hitting a high note in his last outing, his adaptation of the Bard’s Hamlet, set in 90s Kashmir, the announcement of his next project being a period drama, set during the last days of the freedom struggle did create some buzz, and with him casting Saif and Shahid, 2 actors whose best performances have come under his direction, and the mercurial Kangna Ranaut, one might look forward to a spectacular cinematic experience. But is Rangoon the VB magnum opus that we’ve all been waiting for? World War II is on, and British India is under ferment. The seeds of rebellion have been sown, and the Quit India movement has hit a fever pitch, while Subhash Chandra Bose has set up the Azad Hind Fauj and is all set to make a march on Delhi. In the middle of all this, Rusi Billimoria (Saif Ali Khan) is content with making movies with Miss Julia (Kangna Ranaut) as the star, that are a smash at the box office, and maintaining congenial relations with the British Army, represented by the Indophile officer, Major General Harding (Richard McCabe), so when they request him to send Julia to the North Eastern Front to boost the morale of the soldiers, Rusi can’t refuse. What was supposed to be a simple series of shows for the boys, ends up being a life changing experience for everybody as they come into contact with the enigmatic Sergeant Nawab Malik (Shahid Kapoor) and end up entangled in a conspiracy involving a priceless artefact, INA agents within the British Army, leaving everybody wondering if they can get out of this with their life and sanity intact? 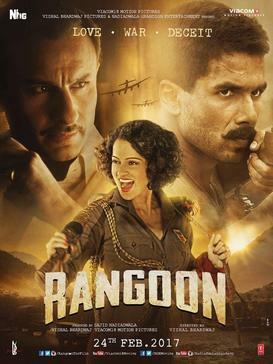 Right from the minute the opening credits roll, Rangoon establishes itself as a movie that doesn’t plan on indulging a distracted audience, as every scene is just filled with so much, that you just cannot look away for even a moment for fear of missing out on a plot detail. It’s quite obvious that Vishal Bhardwaj had an absolute blast filming Rangoon, and it shows. Every frame is a joyous burst of inspired storytelling with multiple plot threads hanging, and even if a few of these threads end up frayed, one is more than willing to look past it, for what emerges is a stunningly intricate bit of embroidery. The cinematography by Pankaj Kumar is absolutely stunning, rich in detail and an absolute treat to the eye. As mentioned earlier, somehow Vishal Bhardwaj manages to bring the best out of every actor in his movies, and Rangoon is no exception. Saif Ali Khan who seems to be channelling Clark Gable, portrays a dark and complex character with utmost conviction and his performance is worthy of being given a pardon for the egregious Humshakals. Shahid Kapoor however steals the show here as the mysterious Captain Nawab Malik and keeps the audience guessing about his motivation, while also bringing out the vulnerability of a boy turned into a man by the ruthlessness of the war he’s fighting. Kangna Ranaut takes some time to make an impression, but after a point, you realize that without any warning, her character has managed to creep under your skin, and oh what a moment that is, when she turns on the entire blast of her charm, and during her more vulnerable moments, drawing inspiration from her own demons. Richard Harding, Saharsh Shukla, Shriswara, Gajraj Rao and Atul Kumar all provide able support, contributing to a top-notch ensemble of characters. To sum it up then, Rangoon is a spectacular period drama, the kind that deserves to be experienced on the big screen, and in spite of a slightly off-key climax, the rest of the movie more than makes up for it. ← Split (2017) Movie Review: Back to Basics! Arey you liked it or not? !